Glampyre, the Rock and Roll vampire, by Martin Ontiveros produce by Toy Art Gallery is back for a brand new run! This time around inspired by ‘everyone’s favorite motorcycle-riding Tokusatsu warrior’. We’re talking about ‘Kamen Rider’ created by manga artist Shotaro Ishinomori. The Glampyre stands 8 inches tall, features articulation at the head, arms, wrists, waist, and boots, and a detailed sculpt in Martin Ontiveros’ signature style. This factory-painted edition features black, green, silver and red spray on bright green vinyl. And of course the classic red scarf. 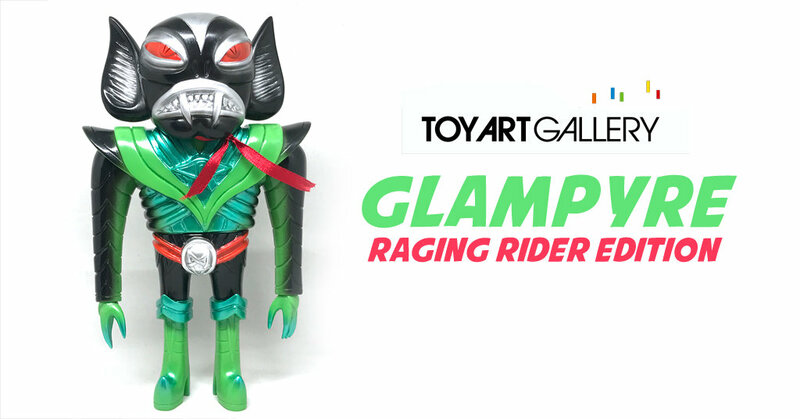 The GLAMPYRE RAGING RIDER edition will be available Friday, 1/18 at 12PM PST for $75, at shop.toyartgallery.com.